Butts Centre 1970's / 80's. (May 15, 2013) edneofflowers said:Listen was located at the top of the escalators in The Butts Centre (now the Broad Street Mall). Great shop with a great stock of metal, imports, indies, the works. One of my faves. Cheers David for the background info, I never knew any of that at the time. I'll always remember getting Cheap Tricks' 'Standing on the Edge' on import about 2 days after the US release and being gobsmacked by how quick Listen had it. A gem of a shop. (July 15, 2012) Administrator said:Thank you David for the contribution to the archive. The owner was Stuart Morgan Mcgill who bought the shop with the proceeds of his inheritance, he lived in Sheffield and would travel down on a Saturday to help out and but lunch for the staff. 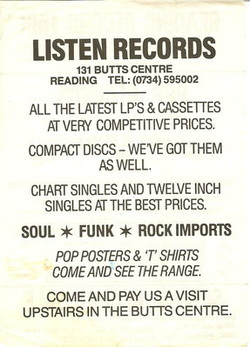 The poster is somewhat misleading as we were an Indie/Metal specialist that also dealt with all the local D.J's so we did indeed have a reasonable collection of dance music although non of the staff were particularly interested in the genre. The shop finally fell foul of the majors that moved into town and undercut us at ever corner, the biggest gripe that I have is that Rough Trade whom we had always supported along with Pinnacle sold us down the river when they offered HMV and Virgin full sale or return on all their catalogue, I've always maintained that this was the beginning of the end.